You can't help but feel cold when out and about in winter, but accessorizing your outfit with this real raccoon fur scarf and matching scarf not only levels up your look, they also take comfort to the next level. Feel how cozy, soft and luxurious the texture of real raccoon fur against your skin and enjoy the warmth it brings. The fur scarf and cuffs insulate warmth efficiently, so you feel comfortable even when you're out on cold chilly days. The winter season may make you feel limited when it comes to options in dressing up. However, wearing the real raccoon fur scarf over your favorite sweater, coat or parka glams up your look instantly. Well-fitting cuffs worn on both wrists finish up your look seamlessly and elegantly. The scarf and cuffs sport high-quality satin lining to reinforce their durability. The satin lining holds the fur together and helps them resist constant wear and tear. Additionally, excellent lining artistry makes the scarf and cuffs look bundled up and more elegant. Equipped with an efficient hook-and-eye closure strategically located to be unseen by the naked eye, attaching both ends of the shawl and detaching them is easy and effortless. You may opt to fasten the scarf across your front body or let the ends fall seamlessly. After Sales Service Ferand has built its reputation in providing high-quality products along with the best form of customer service. Along with the purchase of this product, you also get 365-day warranty on our product's material and production quality, assuming normal use. 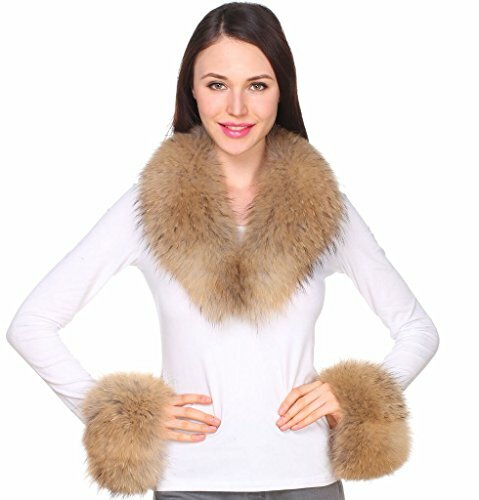 Want to get your own Women's Luxurious Genuine Raccoon Fur Collar and Cuffs for Coat and Parka? Click "Add to Cart" now.